I’ll be uploading pictures, projects, and patterns for my amigurumi in the days to come. Some of the finished objects will be for sale, if anyone sees something they like I can do custom ami’s as well. Please let me know if you make one, I’d love to see it and will even post it here! You may sell finished projects but please do not sell this pattern! 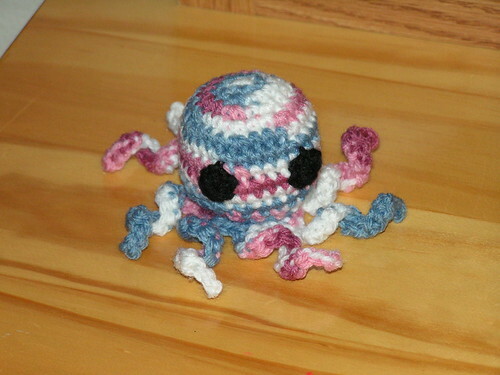 This entry was posted in Amigurumi, Crochet, Original Designs and tagged Amigurumi, Crochet, octopus. Bookmark the permalink. What a cute octopus! I’m a new blogger too. Nice meeting you tonight at Haggen. It’s always fun at Knit-Nite and we love when new people join in. I have a note at my desk to check for the left-handed knitting info. See you next week. How adorable! I wanted to make an octopus for my niece and I think this will work better than the pattern that I was planning to use (I don’t like sewing either!). Thanks! I want to make the crocheted octopus…but not sure what you mean by FLO and BLO in your pattern…can you explain those terms…I have been crocheting for over 30 yrs…but don’t know what that means…thanks..
FLO is Front Loop Only, and BLO is Back Loop Only. If you look at the top of the crocheted stitch it forms a sort of arrow shape, you just insert the crochet hook through one side of that arrow and pull the yarn through as usual. This allows you to crochet twice in the same stitch. Hi: I have a new granddaughter and plan on getting back into crochet. My first project will be hour “All-in-one-Octopus”. What do you mean by “magic ring”. I winged my own octopus similar to this for a kitten once. left it unstuffed and ‘open’ at the bottom so I could put scrunched up paper in it 🙂 Kitty loved it. I don’t know what language your post is in, but I followed the link and the octopi are just precious!